This archive article was originally published in the Summer 2016 issue of Antiques & Fine Art magazine. It all started with spices. In the early seventeenth century, Dutch merchants began importing pepper, nutmeg, cinnamon, and other pungent flavorings from Asia to enliven European dinner tables. Sailing from the Netherlands to ports in Indonesia, Japan, India, and many other places, the adventurous mariners of the Dutch East India Company (VOC) developed a lucrative trade network throughout Asia. The VOC was the largest and most powerful trade and shipping company in the world and became the world’s first joint-stock company. VOC ships returned home with wondrous and unfamiliar forms of Asian art that captivated the Dutch. Imagine how refined and weightless a translucent porcelain cup from China must have felt when compared to a heavy stoneware mug. Brilliantly colored, gossamer-thin Indian cotton and vibrantly colored Chinese silk must have made European wool and linen look drab. Collecting, displaying, and even wearing Asian goods became the rage—nearly every townhouse along the canals of Amsterdam contained some of these costly treasures. 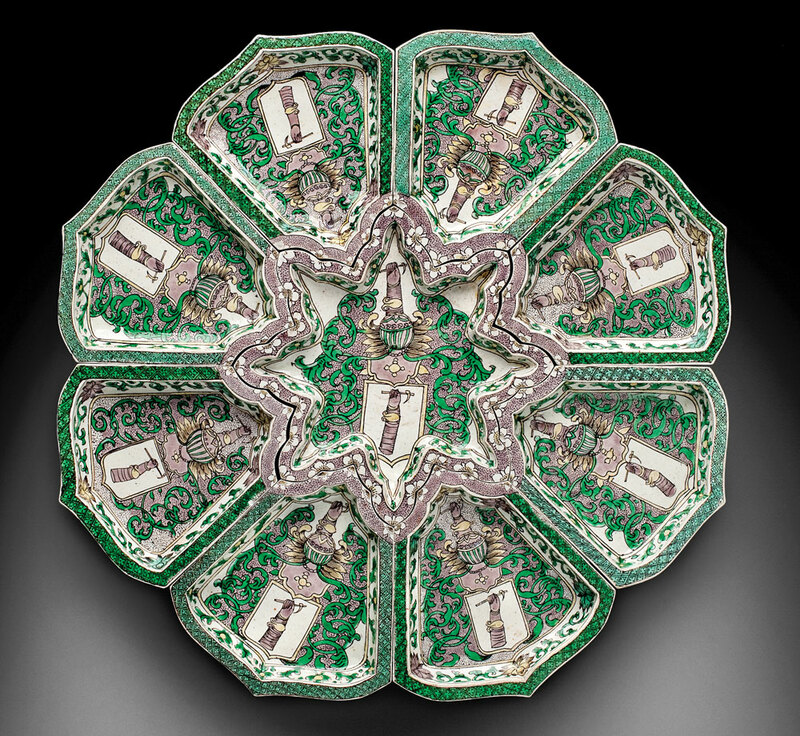 Asia in Amsterdam: The Culture of Luxury in the Golden Age, an exhibition co-organized by the Peabody Essex Museum and the Rijksmuseum examined how the Dutch perceived and valued these luxuries, and also how they incorporated them into their homes and daily lives. 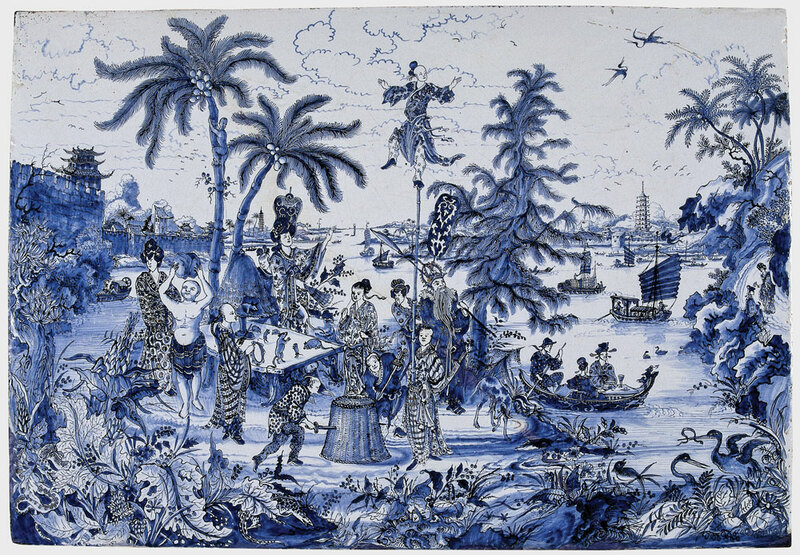 Dutch consumers may have celebrated Asian imports for their foreignness and the tremendous distances they had traveled, but many would have been less aware that the potters of Jingdezhen and Arita, the silversmiths of Batavia, and the textile dyers of Surat and the Coromandel Coast adeptly altered the designs and shapes of their wares to cater to different European and Asian markets and to satisfy Dutch conceptions of Asia. Dutch artists, inspired by these new sensory delights, were quick to imitate, innovate, and incorporate. 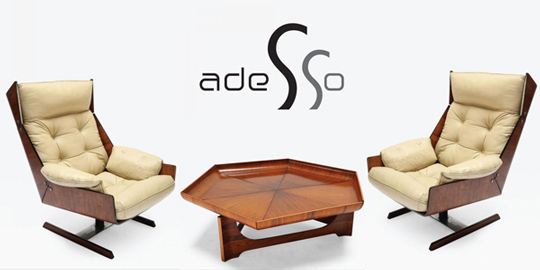 Their diverse creations underscore the esteem with which they held Asian luxury goods in the seventeenth century. Still-life paintings and delftware are perhaps the clearest examples of Dutch appropriation of imported Asian material culture, but Dutch artists also produced silk and cotton textiles, furniture, and even imitation lacquer that was inspired by Asian imports. 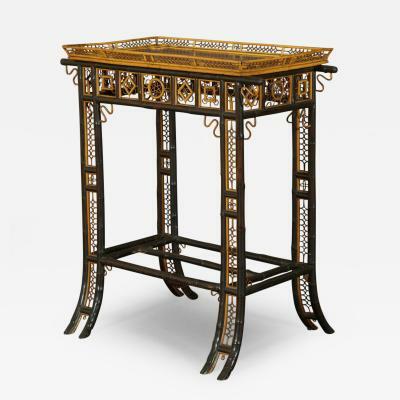 They adapted unfamiliar design motifs and technologies, and sometimes even incorporated imported Asian works into the innovative decorative arts they created. 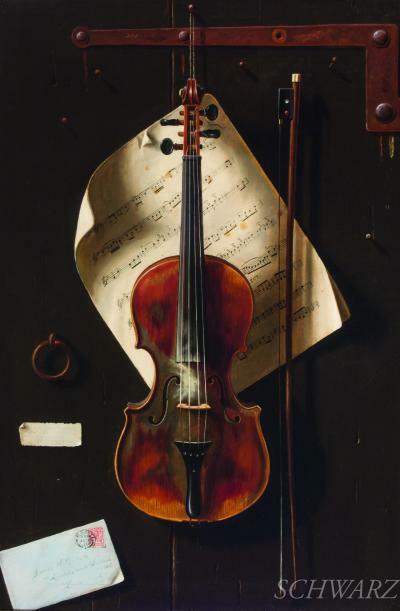 Equally, Dutch painters captured in their compositions the unusual forms and appealing surfaces of many imported treasures. All of these artists transformed the art of their age into something we now perceive as distinctly Dutch. 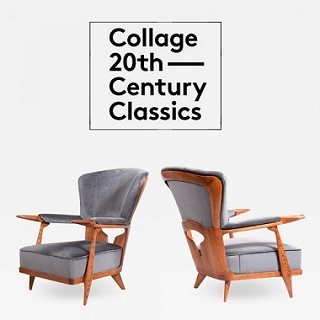 Approximately two hundred of these superlative works of art were featured in Asia in Amsterdam: The Culture of Luxury in the Golden Age at the Peabody Essex Museum, Salem, Massachusetts, the only U.S. venue for the show. 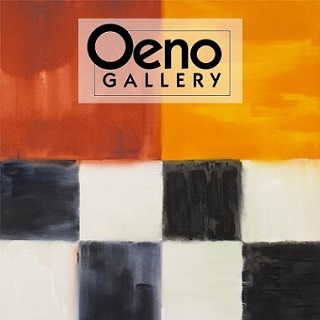 The exhibition was on view from February 27 through June 5, 2016, and featured works by some of the finest Asian and Dutch artists of the time, including paintings, textiles, ceramics, jewelry, and lacquer. The exhibition catalogue, published in partnership with Yale University Press, contains essays and catalogue entries by thirty scholars. For more information visit www.pem.org or call 866.745.1876. As Dutch global trade expanded, Amsterdam became one of the largest and most dynamic cities in Europe, renowned as a hub for goods and information from Asia. This economic prosperity coincided with a period of unparalleled innovation in Dutch painting. 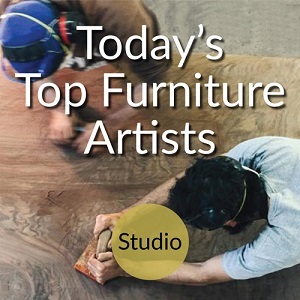 Dutch painters, including Willem Kalf, Jan Steen, Pieter Claesz, and Van de Velde were quick to incorporate imported luxuries and design motifs into their still life paintings. In this poem to Dutch pride and prosperity, Van de Velde has placed a delicate Chinese “kraak” porcelain plate filled with peppercorns at the heart of his composition. Pepper, the VOC’s main Asian import to the Netherlands, was used in most Dutch households. Typically, the company imported around four million pounds of pepper annually, and VOC ships supplied half of all the pepper on European tables. A pewter tankard stamped with the seal of the city of Amsterdam lies directly behind this group to underscore the city’s central role in the VOC trade. Rijksmuseum, Amsterdam. Purchased upon the recommendation of the Vereniging Rembrandt, with the support of the Stichting Nationaal Fonds Kunstbezit, thanks to a gift of Royal Dutch Shell, and the BankGiro Loterij. With the rapid increase in commerce, Amsterdam quickly became the largest city in the Dutch Republic. 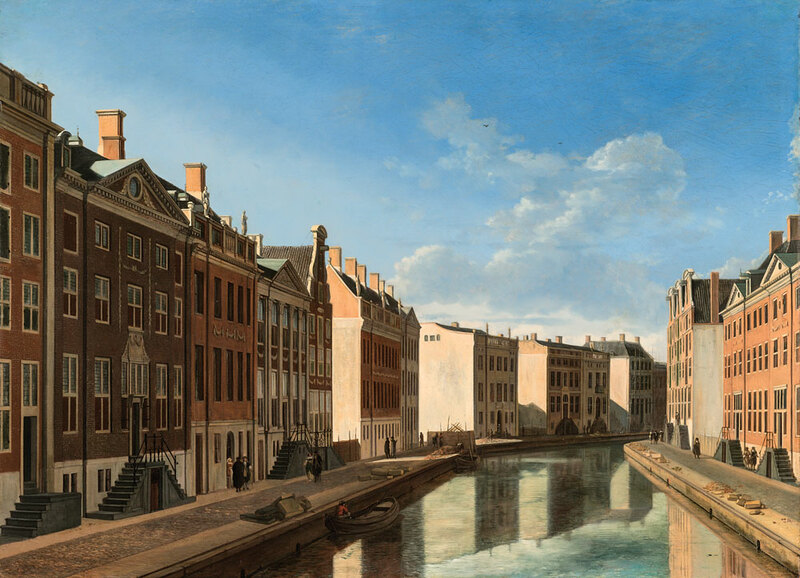 Just as Amsterdam’s harbor expanded to accommodate more ships, the city itself needed to grow. Amsterdam’s celebrated canal ring was built in sections in direct response to the city’s expanding population and prosperity. In this architecturally accurate view of the most exclusive section of the city—the Park Avenue of its day, Berckheyde depicted the completed townhouses of bankers, merchants, and city leaders next to empty lots awaiting construction. In these homes of the city’s elite, works of art and costly objects from Asia would have been familiar sights in nearly every room. 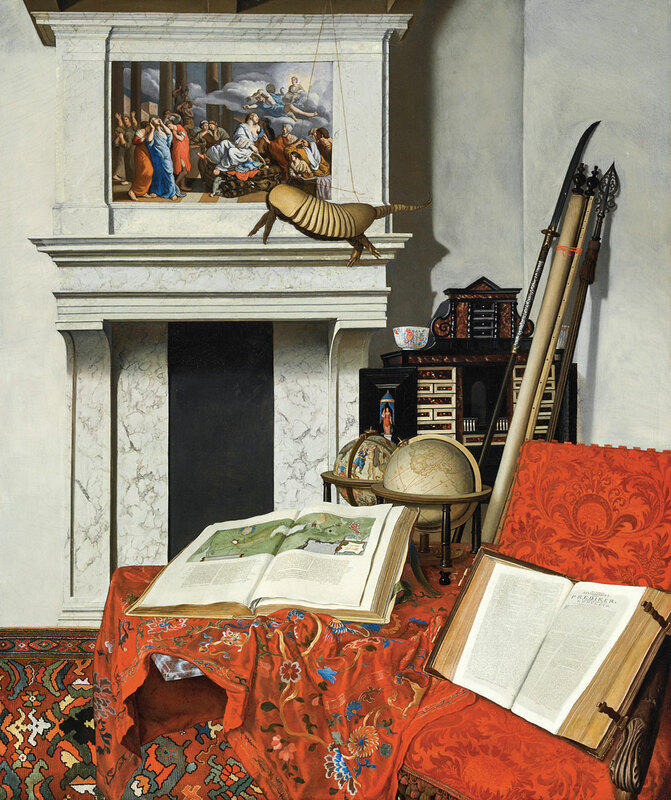 Jan van der Heyden’s painting vividly registers the arrival in Amsterdam of art and curiosities from Asia. The massive Blaeu atlas spread open on the table, the globes and the rolled-up map signal worldly interests piqued by the burgeoning Dutch trade, while Asia is represented in the gathering of imported objects such as an embroidered Chinese silk cloth, a Turkish carpet, and a Japanese porcelain bowl. 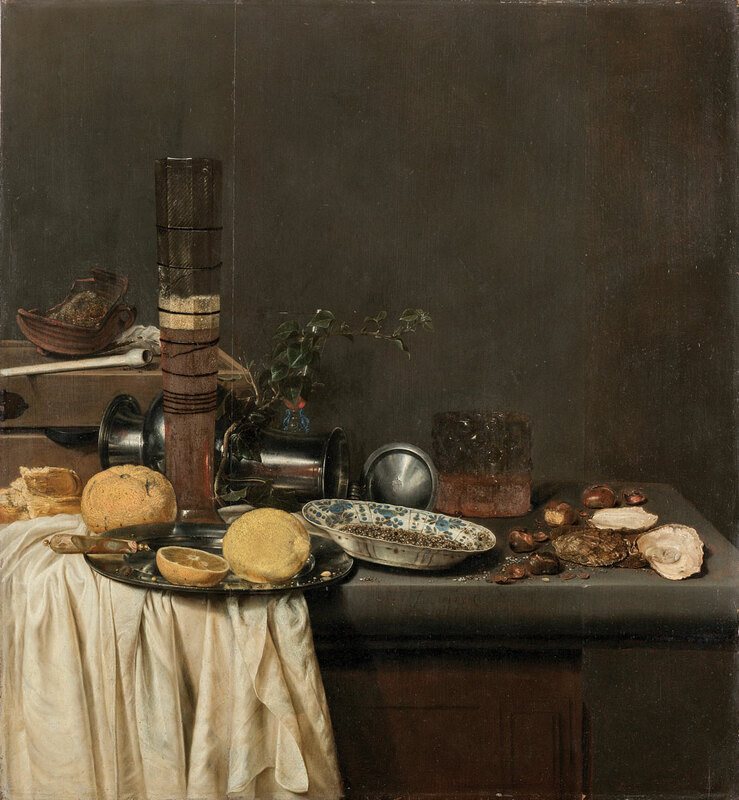 Dutch artists depicted exotic goods in many still lifes, but this composition is unusual in that it reveals a whole corner of a distinguished collector’s cabinet. The artist lived on the Herengracht, the most fashionable canal in Amsterdam, so he may have owned these imported treasures himself. Surcoat (Jinbaori), Japan, mid-eighteenth to early nineteenth century. 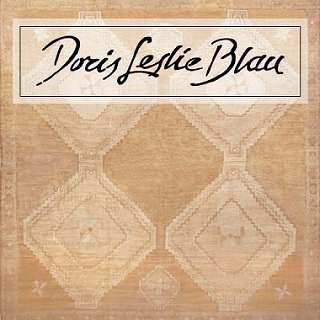 Dutch leather and wool, lined with European printed cotton and trimmed with silk, 36 x 24 inches. Peabody Essex Museum, Salem. The Dutch were not the only people interested in “foreign” luxuries. In Japan, Dutch gilded leather was appreciated as an exotic curiosity. The VOC imported Dutch leather wall coverings to give as gifts to the emperor and officials. Japanese recipients often made the leather into pouches for tobacco or used it to cover small boxes and screens. 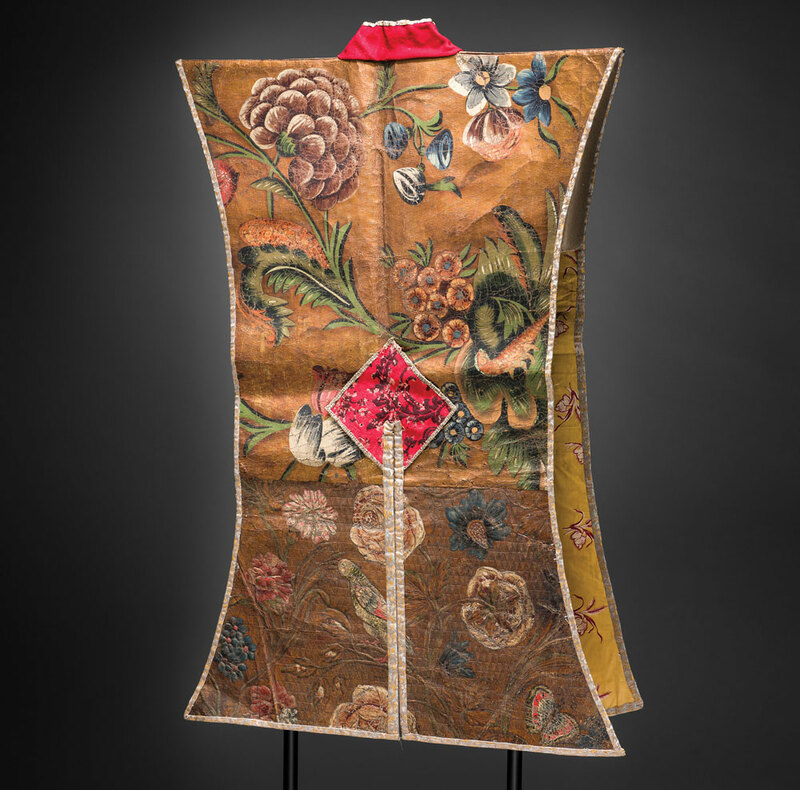 This Japanese nobleman’s coat is a particularly extravagant example of Japanese adaptive reuse of Dutch gilded leather. 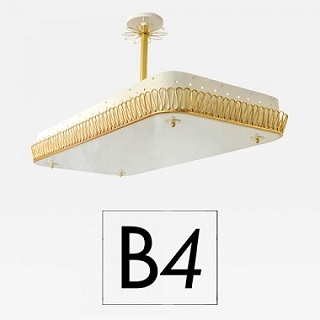 It is made of three different patterns of gilded leather, accented with imported European red wool. This fascinating portrait of a seventeenth-century multicultural family epitomizes the complex role of the VOC in Asia. 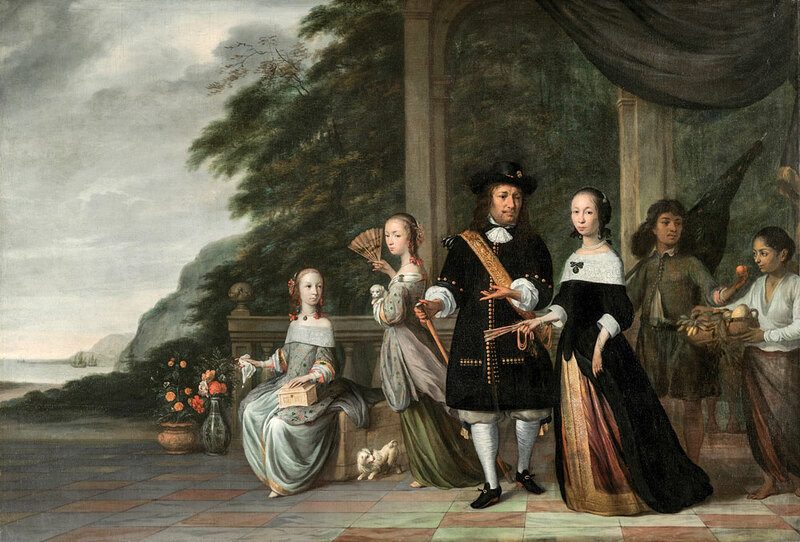 Painted by a Dutch artist in Batavia, the VOC’s capital in Asia, the portrait features VOC merchant Pieter Cnoll, his wife, their two daughters, and two of the fifty slaves in their household. Cnoll’s wife, Cornelia Nijenrode was the daughter of a VOC official stationed in Japan and a Japanese courtesan. The painting reflects the family’s social status through their splendid attire, fine jewelry, and tangible reminders of their wealth and access to luxuries from throughout Asia. Daughter Catharina holds a Japanese fan and a small Pekingese dog. On Hester’s lap rests a finely carved ivory box from Ceylon. On the right, stands Untung, a Balinese slave who held the prestigious position of household umbrella carrier. Later in life, he fled Batavia and fought against Dutch oppression in Java. Sweetmeat set with the coat of arms of Johannes Camphuys. Jingdezden, China, 1671–1690. Porcelain. D. 14-1/4 inches. Peabody Essex Museum, Salem. Museum purchase with funds donated by the Asian Export Art Visiting Committee. Johannes Camphuys (1634–1695), a career VOC official, held posts in Japan before becoming governor general in Batavia (modern day Jakarta) from 1684 to 1691. He was famous for offering his guests Japanese cuisine; one visitor recalled being served “several small bowls with a little boiled rice and some compotes . . . one mostly had to shuffle the food into the mouth in the Japanese way with two long round chopsticks.” He may have served these delicacies on a set of small Chinese plates decorated with his family’s coat of arms, an elegant and exclusive commission for Camphuys’s dining table in Batavia. Personalized luxuries such as this remained a rarity throughout the seventeenth century because of the great distances between makers and consumers and the complexities of ordering them. In this portrait by Luttichuys, a fashionable young woman wears a brooch of rose-cut diamonds and a pair of giant pearl earrings. Strings of creamy white pearls encircle her neck and wrists. 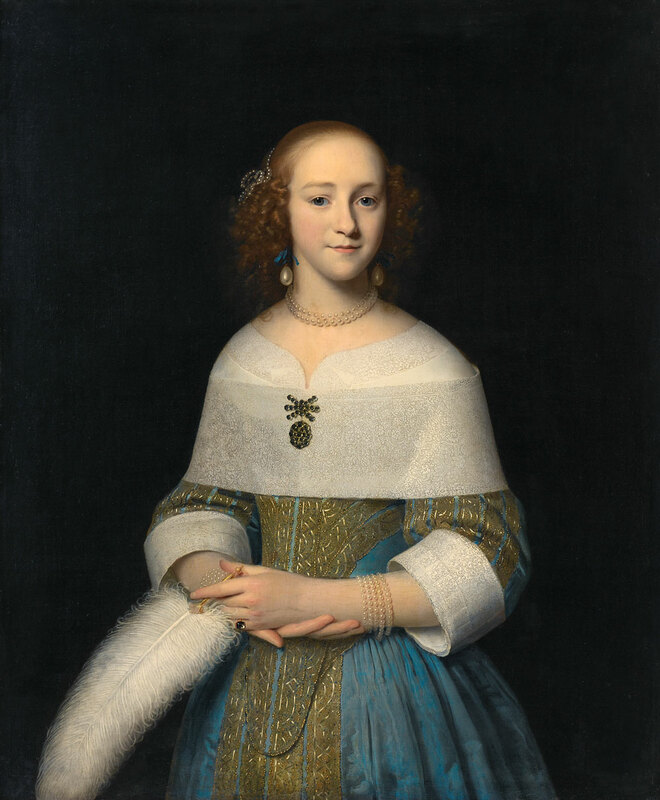 Just as Dutch families decorated their homes with luxuries from Asia, they also “wore Asia,” ornamenting their bodies with Asian imports including Indian cotton, Chinese and Persian silk, and jewelry set with Asian gemstones and pearls. 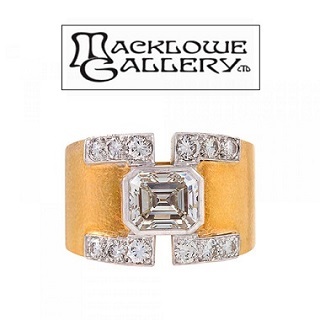 The only sources for diamonds until the 1720s were India and Borneo, so diamond jewelry had a direct connection to Asia at this time. From the 1620s to the 1660s, the VOC imported large quantities of diamonds to the Netherlands, and Amsterdam emerged as the European center for diamond cutting and resale. Shells and other natural specimens from Asia were eagerly sought after by collectors in the Dutch Republic, not only as items of curiosity, but also for purposes of scientific study. 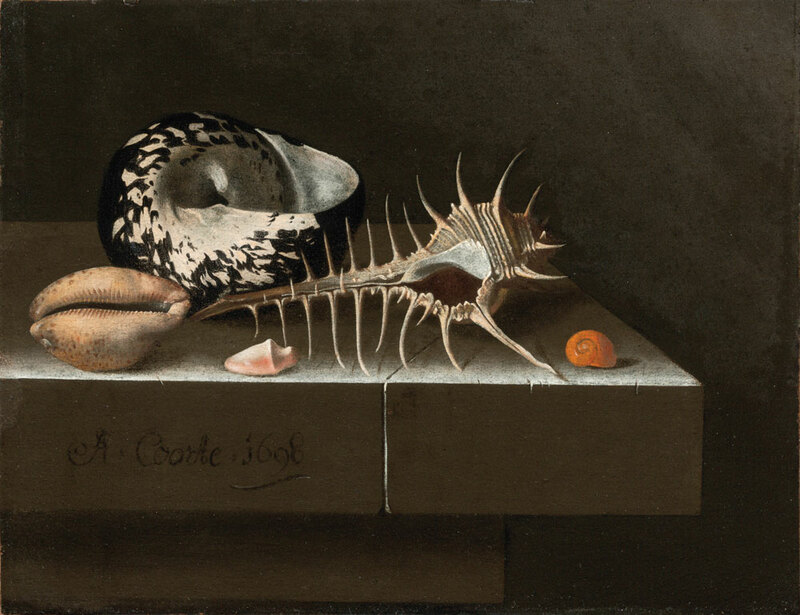 Collectors in the 1600s would have recognized a view of the wide world in Adriaen Coorte’s simple composition of shells from different tropical waters. The flamingo tongue snail (Cyphoma gibbosum) is from Brazil, a Dutch colony in the mid 1600s; the mollusk (Cittarium pica) hails from the Indian Ocean, and the rare shell at center, the Venus comb (Murex tribulus) from Southeast Asian waters, rarely survived with its delicate spines intact. Coorte transformed these exotic shells—symbols of wealth, fertility, and sensuality—into objects of singular beauty, conveying fragility and grandeur in this small painting. Cabinet on stand. 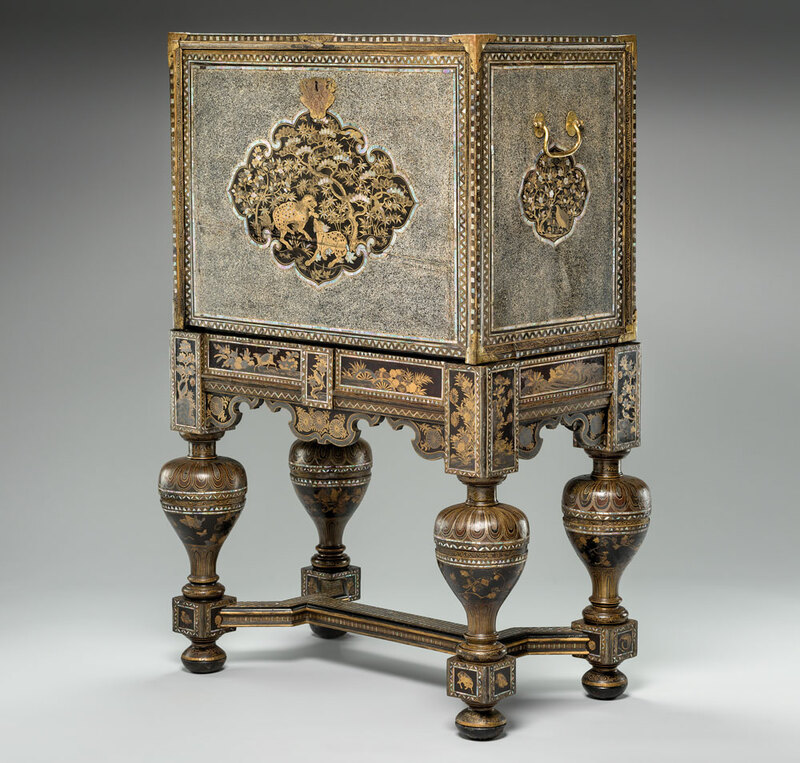 Cabinet, Japan, 1600–1630; stand, Japan, incorporating elements from a Dutch table, 1625–1650. 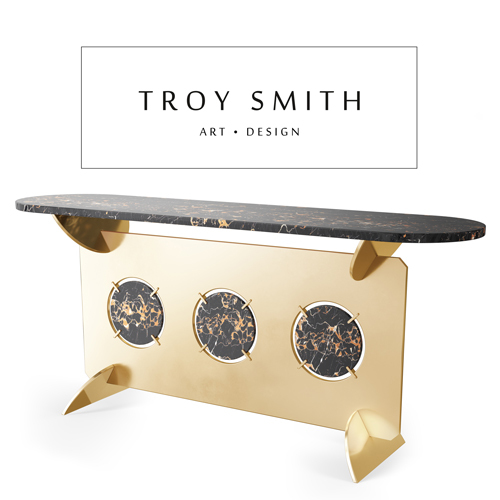 Oak and Chinese arborvitae covered in black lacquer, with gold and silver hiramaki-e, ray-skin denticles, mother-of-pearl, and gilt copper mounts. 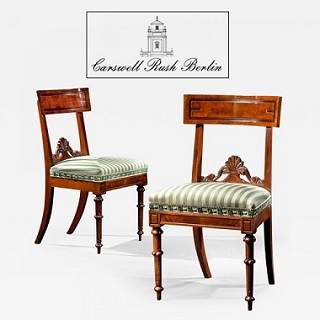 Cabinet: H. 25-1/4, W. 35-3/4, D. 20-1/2 inches; stand: H. 30-3/4, W. 40-1/2, D. 24-1/4 inches. Peabody Essex Museum, Salem. Japanese lacquer cabinets were imported to Europe, where they were often mounted onto European stands; this example survives with a highly unusual stand also lacquered in Japan. The two components of this piece incorporate several different lacquering traditions practiced in Japan during the seventeenth century. The fall-front cabinet is decorated with reconstituted ray or shark skin, a labor-intensive but durable technique known in Japan as samegawanuri. 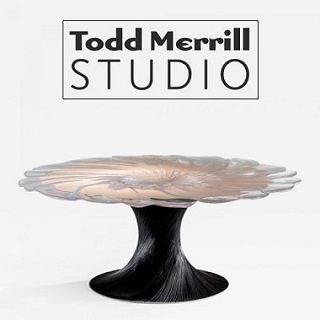 The base is not decorated with ray skin, but instead decorated elaborately with lacquer, gold, silver, and inlaid mother-of-pearl in a wide range of patterns, each component incorporating different designs. VOC agents in India brought back to the Netherlands many Indian miniature paintings, some depicting Mughal rulers. A lavish sale in Amsterdam in 1685, for instance, included Indian drawings and paintings, as well as a cabinet of curiosities containing horns, shells, agates, minerals, pearls, and exotic fish and birds. Rembrandt’s own encyclopedic collections, which he frequently used for inspiration in his work, included an “[art book] full of curious miniature drawings.” By examining Rembrandt’s own work, we can derive a sense of the Indian drawings in his collection and those to which he had direct access. 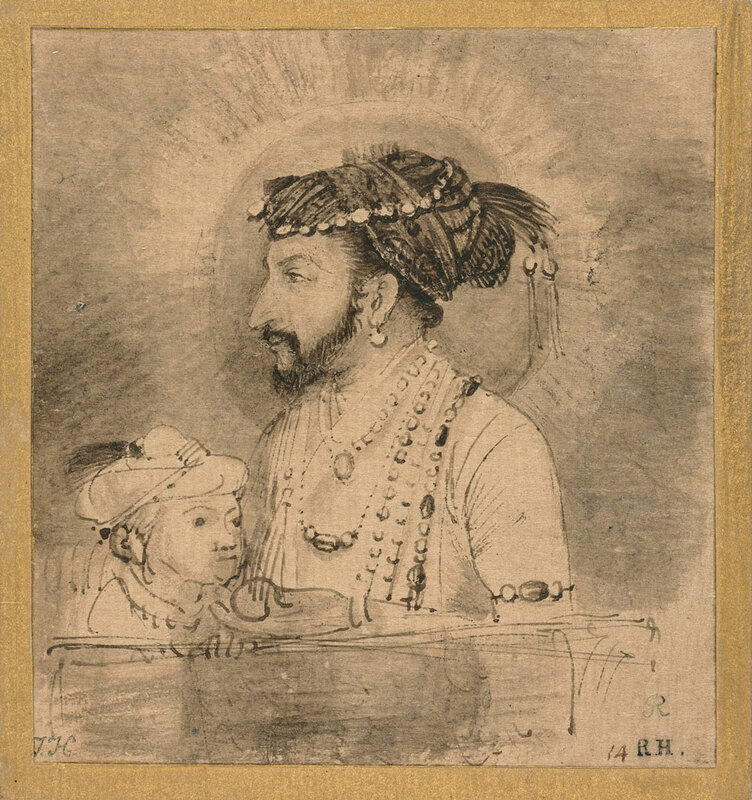 Rembrandt based this small pen and ink drawing on an Indian miniature portrait of the Mughal emperor Shah Jahan and his son. The exhibition includes a closely related Mughal miniature of Shah Jahan from the Metropolitan Museum of Art’s collection. Plaque, Delft, The Netherlands, 1670–1690. Tin-glazed earthenware. H: 25 x W: 36-1/4 inches. Rijksmuseum, Amsterdam. Amsterdam became an important center for publishing in the seventeenth century, and through its books, many in Europe learned more about Asia. An account of the Dutch diplomatic visit to China in the 1650s was one of the most popular and was printed in at least five languages. Dutch artist Joan Nieuhof participated in the embassy and recorded his impressions of the journey. Prints based on his drawings seemed to provide a realistic impression of China, but they were produced from his European perspective to cater to the expectations of European audiences. 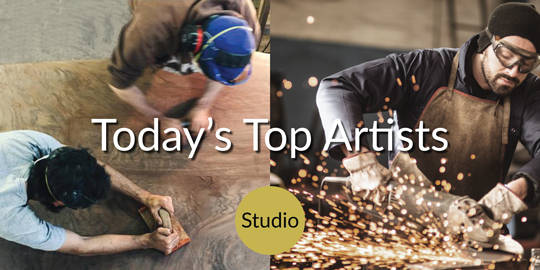 These images of China inspired artists in many different fields. The designs on this plaque are taken directly from Nieuhof’s prints. 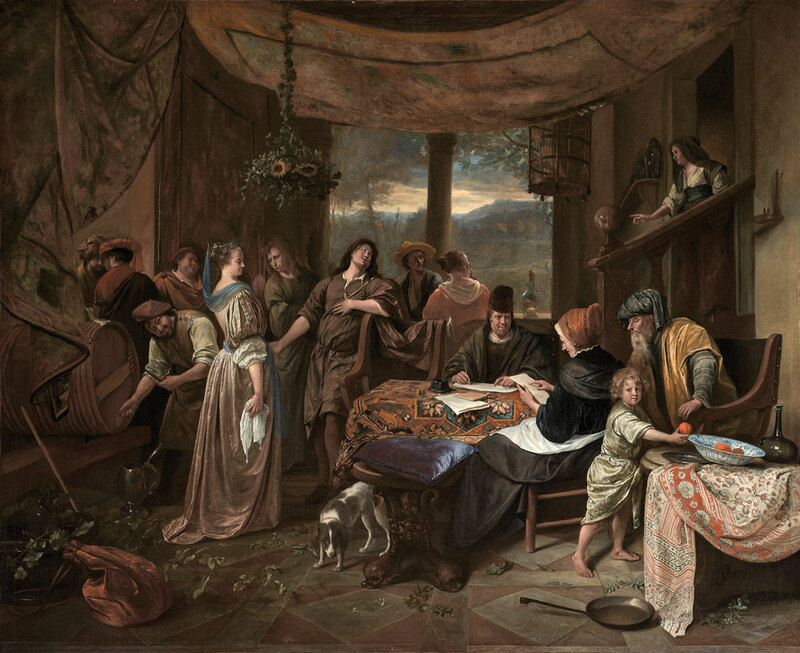 Dutch genre painters such as Jan Steen commonly depicted historical or biblical stories in familiar domestic settings. Here, the marriage of Tobias and Sarah takes place in a village tavern. The carpet adorning the center table, the large Chinese porcelain bowl to the right, and the Indian cotton cloth draped beneath it are evidence of the abundance of Asian exotic goods in Dutch society. The printed Indian cotton appears in at least six of Steen’s paintings. 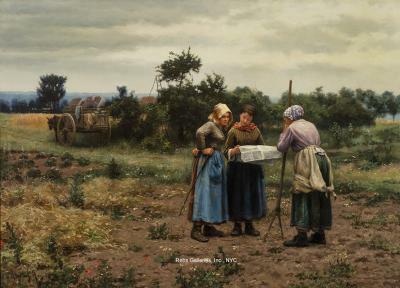 Although no inventory of the artist’s belongings exists, Steen, who was noted for his masterly depictions of textiles, must have owned the cloth himself. Indian printed cottons were a less expensive—though nonetheless exotic—alternative to finely painted Indian chintzes. Sometimes referred to as “coarse calicos” or “Surat prints” (referring to Surat, a major center for the production of printed cottons), such fabrics made up the bulk of the Indian textile exports in the early seventeenth century. Karina H. Corrigan is the H. A. Crosby Forbes Curator of Asian Export Art at the Peabody Essex Museum, Salem, Massachusetts. Adapted from entries by Janet C. Blyberg, Karina H. Corrigan, Femke Diercks, Martine Gosselink, Julie Berger Hochstrasser, Menno Jonker, Monique Rakhorst, Pauline Lunsingh Scheurleer, Roosmarie Staats and Jan van Campen in the catalogue Asia in Amsterdam: The Culture of Luxury in the Golden Age. 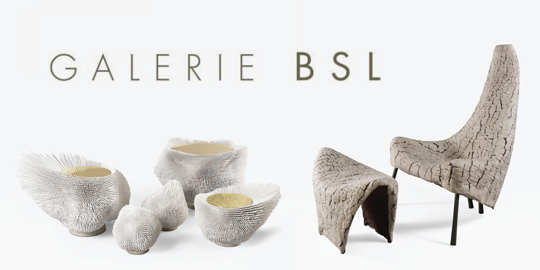 The exhibition was on view at the Peabody Essex Museum February 27-June 5, 2016. 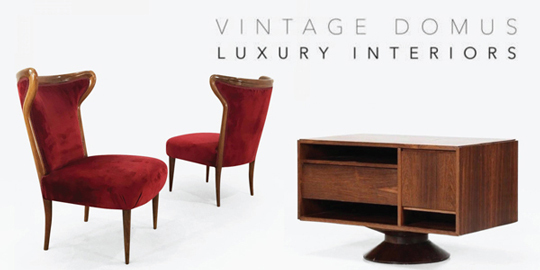 This article was originally published in the Summer 2016 issue of Antiques & Fine Art magazine, a fully digitized verson of which is available on afamag.com. 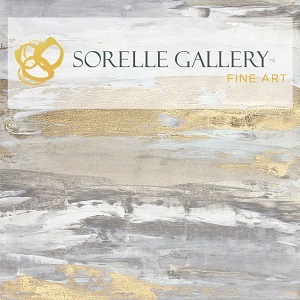 AFA is affiliated with Incollect.